Well … it has been a long road. One that began even before I joined the University of Texas but today, after 8 1/2 years, I completed my degree requirements. As many of you know, back in October I had my oral exam and was thrilled to get all my signatures. It has taken some more work but today I walked across campus with my paperwork and made it all official. It took about 20 minutes and I only forgot one form (fortunately they had extras). Got the email confirmation. Now … let’s see how long it will take to sink in. So graduation is in May. I will definitely be doing the walk. Graduation weekend is May 21-24, with the University-wide graduation on the Saturday. Further details are not yet know. 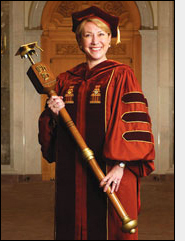 The picture shows UT’s official regalia … we’ll have to see if I want to buy the regalia or rent (rentals are black). Does anybody know what the staff is for? Adjusting to change can be difficult but sometimes it’s just good. 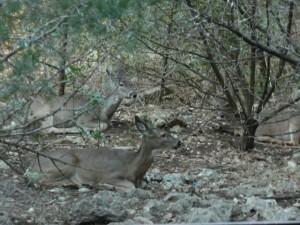 I say this because we are starting to get settled into our new digs and are enjoying the view. I thought I would share with you the view I had on Friday. This picture was taken around lunchtime. I can’t believe that 2009 is here already. While it didn’t start with a bang, it’s going to be interesting none-the-less. I wanted to start the new year with a new entry that wishes everybody a Happy New Year! Hope your year is as amazing as I expect ours to be.